I have been quizzed quite a lot over the years about what you expect from the knife at your side and it can be a very extensive debate as essentially everything becomes a compromise. There are some that expect, and think that, if you build it with thick enough steel and as many "tough" materials as you can get hold of it will make it indestructible, well sorry chaps, it doesn't - everything has a breaking point! 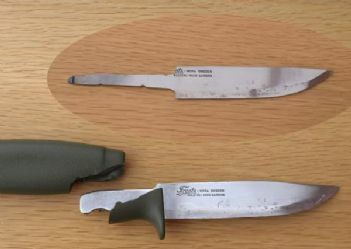 Many makers will tell you that their knives are indestructible but it simply isn't true. There are many things that will cause damage to any tool and it is just a matter of selecting the right tool for the job - a knife isn't always that tool. I think the best advice anyone can give is just to be realistic and remember that a knife is a cutting tool and not an Axe, Saw, Log Splitter, Hammer, Spade or Pry Bar. No one knife can do every job you can ever plan for it but there are knives that will do most of them - hence the evolution of your typical Bushcraft or Survival Knife. There are a few things that will prolong the life of your favorite tool and I hope to shed a little light and steer people away from some practises that may damage it. 1) Battening. This is the act of placing your knife on the top of a log or piece of wood and striking the spine/back of it with a "hammer" (usually another piece of wood) in order to split the piece of timber. Whilst all knives, to some extent or another, will stand up to it there is a bit of a "fashion" (for want of better word) for using a Bushcraft/Survival knife almost as a daily tool for log splitting instead of a specialised splitting tool such as a splitting axe or wedge. Unfortunately there are many makers out there that profess that their knives are indestructible and battening is perfectly fine. This gives the wrong impression because usually the timber being used is far too thick and dense and there are too many forces, in too many planes, acting on the blade. It may split a similar log 1000 times without a single issue but I assure you that even the strongest blade will break eventually (see images). It is OK if you are splitting small pieces of wood for fire lighting (1" thick or smaller), as you will likely never experience an issue as you shouldn't be applying too much force, but, anything bigger you have to ask yourself , "Do I really need to split this?" If you do then use a more specialised tool. For this reason it is natural for us to recommend you not batten with a knife. Even knives from the best makers in the World will experience damage when they are misused and we have seen irreparably damaged knives from Mora, Spyderco, SOG, ESEE, Becker, Ka-Bar and many, many more. We sell a lot of knives and the most common cause for breakage, across the board, without doubt, is battening. It can be as high as 9 out of 10 knife issues are caused because of this practise and this is why we offer this advice. Just think, if your knife is your only tool you have with you do you really want to risk irreparable damage? If that knife is your life line then sorry... you've failed, and it may cost you your life, not just your knife! 2) Firesteel Striking - Using a Ferro rod to light a fire. 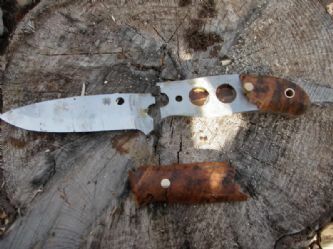 We have had issues where people have used the blade of their knife to strike a ferro rod. Whilst it is fine to use the Spine/Back of your knife for firelighting using the blade itself should always be avoided. I will guarantee you will damage the blade. I will say though that if you are lighting fires on a very regular basis it is probably best to use a dedicated striker, most firesteels come with one. 3) Please don't dig with your knife - yes it does happen! If you insert your knife into the ground on any occasion please be aware that it will likely come into contact with some very hard rock. This will chip your blade. 4) Steel care. It is obviously important to know what type of steel your knife is made from, and I don't mean you have to get the entire chemical content etc. - simply what grade of stainless or carbon steel it is made from. With stainless steels there is not a lot of maintenance you need to do but it is always best to keep it clean and sharp. With carbon steels you will need to clean it and oil it whenever is practical. Try and accept the fact that carbon steel will tarnish a little over its lifetime and, whilst the general opinion is that Carbon steel is harder, this is not necessary the case as modern stainless steels are extremely good, hard and hold an edge longer. 5) Blade care. It is always best to keep your knife from going blunt as it is much more difficult to get the shave sharp edge back once you have lost it. Now don't get me wrong, don't bother sharpening your knife every 10 minutes and worrying too much about it, just regular maintenance will keep it in tip top shape. I am afraid that I am not one of the school that spends hours on end getting a mirror polish on knives, a simple fine grit sharpen and maybe a strop every now and then is perfectly alright. Remember if you are using a knife regularly then it is not a show pony it is a work horse and will get a nice lived in patina over time. 6) Sheath care. You don't need anything fancy to care for a leather sheath, if it gets wet let it dry out naturally (without the knife in it) and simply use some treatment on it. A good quality leather balm is great for this but any saddle oil or leather nourishment is good. If it is getting scuffed then simply use a shoe polish in the closest colour and it will work a treat. I think the best thing to remember is that if you look after your kit it will look after you. None of this advice is supposed to be alarmist, quite the opposite. When you buy a good quality knife it will stand up to all sorts of punishment but when you have just tried to pry a track off a Challenger Tank with it please don't blame the manufacturer when you break it.